By design, most bathrooms leave little room for major improvement in terms of storage and organizing. These tips can help you make the most of the space you have - and help get everyone out the door on time each morning. Start the bathroom organizing process by cleaning out the one major area in the bathroom that was designed specifically for toiletry storage - the medicine cabinet. 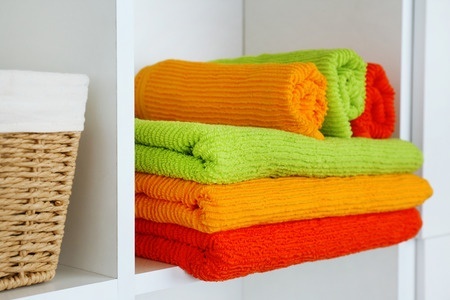 From there, these bathroom organizing ideas can help you control the clutter inside. Get rid of expired medications as well as any toiletries you've had for longer than two years, including shampoos, lotions, makeup, and soap. Besides creating more space, clearing out your medicine cabinet will minimize health risks, as bacteria and fungi can contaminate lotions and cosmetics over time, and expired medications should be tossed upon expiration. If you've cleaned everything possible out of your cabinet and you still can't control the clutter, consider installing a second wall-mounted medicine cabinet. Or you can hang a shower caddy over the shower head to keep shampoo, shaving cream, soap and razors within reach but somewhat out of eyesight. Another space-maximizing device is a system of coated wire roll-out baskets which can be used to expand the storage capacity of under-the-sink cabinet space. If your bathroom has no storage space there, mount a small coated-wire grid on the wall and hang personal appliances such as hair dryers and curling irons from it with S hooks. Take advantage of the empty space above the toilet by adding a small cabinet or shelves to hold extra linens or toiletries. Freestanding over-the-commode shelves can maximize this space right up to the ceiling. But be careful what you display here; small items that fall into the bowl will be no fun to retrieve. You can also place your deodorant, perfume, hair dryer, and hairbrushes in the clear plastic pockets of a back of the door shoe holder. This will keep these frequently used items from taking up counter space but within easy reach. A second curtain rod, added behind and level with the first, provides a handy place to hang wet towels so they can air dry before you fold and return them to the rack. If your shower has glass doors instead of a curtain and there's no place to hang a second rod, you can make more space for towels by replacing existing racks with sets of decorative hooks. Since running out of toilet paper is something we'd all like to avoid, store at least one spare roll in the bathroom rather than in the linen closet. Hide the extra roll in a simple basket so you, your family, or a guest can grab it in a moment of need.